So fine, so soft! 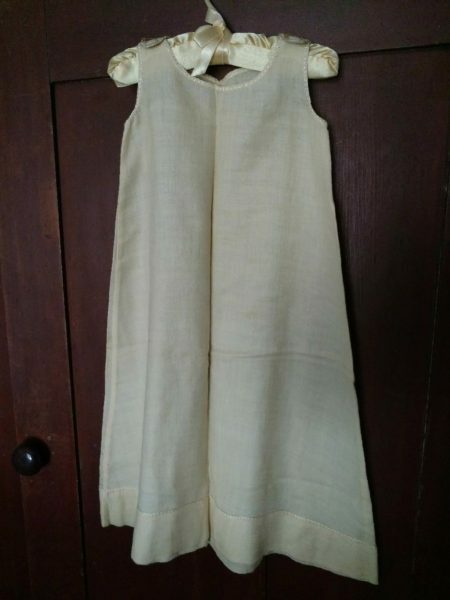 A beautiful silk wool fabric long slip for a baby. Dating about 1920’s, the petticoat is home sewn, simple construction but the workmanship is gorgeous. Silk embroidery thread is used to finish the neck line and arm hole seams in blanket stitch embroidery. The hem has been turned to the top side with blanket stitch embroidery to finish. Tabs of the shoulder straps are safety pinned to the front side.